With eight scorchers over 90 degrees this month, Los Angeles has been in the midst of the second-hottest October since 1877, according to climate records. Yes, the outlook is bleak. Drought conditions are becoming more obvious. 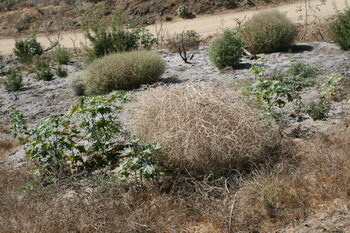 On a hike in Griffith Park this enormous tumbleweed with a length of nearly four foot was a sharp reminder about weather conditions and the change in vegetation. Tumbleweed in the city? We are talking Los Angeles here, not a ghost town in the Mojave Desert. After nearly eight months without rain it is time for some clouds to roll in. We saw a few tumbleweeds on our trip. A friend collected one in West Texas, and hung it from the ceiling as art. It was pretty cool, except it kept shedding thorns everywhere. What an interesting idea for decoration. I could imagine that it looks really striking in the right surroundings. It did look neat. I’ll bet you could string some lights through one, too, and that would be interesting. Maybe it could even be used as a chandelier. I think it would need to be laquered or something first, though, to keep it from shedding and from drying out to the point it caught fire from the lights.